PyTango is unable to create the Database device because it can detect the TANGO_HOST. Did you set the TANGO_HOST environment variable? I sincerely advice you to read the Tango docs and previous posts in this topic. All the information regarding Panic assumes that the reader has a good level of Tango programming. You'll need some try and error to develop these skills; so please follow the documentation and practice with Tango so you'll get the knowledge to follow the most advanced guides. Anyway, most of options don't need to be modified unless you have a deeper knowledge of Tango. I advice you to use the default values and play just with AlarmThreshold, PollingPeriod and Enable. Don't modify the other properties until you'll have a better knowledge on how devices interact with each others (timeouts and exceptions). I have set the TAnGO_HOST environement variable and read the documents of PyAlarm device server. 2.) I have to use Panic GUI over network. In PC-2, I set the tango host as the "IP oF PC-1:10000". So How to use the Panic gui over network ? You should try to connect to the database from a python shell e.g. ipython or itango. Alternatively you can debug the application at this point. Do you have any TANGO expert in your team who can help you? This is a fairly basic problem and not really specific to Panic. Could you try this code in both PC-1 and PC-2 and paste here the output you get? Now I am able to run Panic gui from other PC also. It was my mistake. I didnot set the path of PyTango in python path, thats why the above error was coming. Then … what do you mean by "connecting Panic with Taurus"? 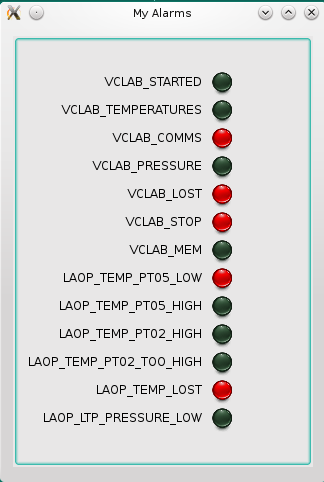 I have made one gui in taurus and there is one button in which I have to display the overall status of alarm. If alarm comes it should be red and on recovery it should be green so the operator who uses taurus gui comes to know about the alarm status. So how to achieve this ? Also what does "Use Taurus" specify ? It should be put "false" or "true" or "anything else" ? How to add boolean attribute of alarm to taurus widget ? My team is new to Tango so we are finding it bit difficult. You guys are the only people whom we can reach for help. And trust me you guys are doing amazing job, even after having so much work pressure , you take out time and reply to our/others queries. The UseTaurus property is related to how each PyAlarm device connects to Tango, whether using the taurus.core classes or PyTango proxies instead. It is an internal feature of the device server and it is still under test, so I advice you to keep it always equal to False. When the usage of taurus.core will be fully tested it will become True by default (if taurus is available). Well, the previous example will display leds in GREEN for active and "dull" green for inactive. (if any taurus guru feels chest pain after reading that, please reply with a better recipe). The code I pasted should display something like the attached screenshot. The setLedColor will set RED for ON and "dull" RED for OFF. There is setOnColor and setOffColor available for TaurusLed. With that, normally it will be like the screenshot.